With a price difference of $500.00, the Bowflex Revolution XP Home Gym is a slightly toned down version of the main Bowflex Revolution home gym. It still uses the same smooth, versatile resistance engine as the original Bowflex Revolution with a compact space-saving design. Some of the minor differences between the two are 20lb less of resistance with the XP version, and it also offers just a few less exercises (about 90 compared to 100 from the XP version). SpiraFlex Resistance Technology is Bowflex's patented resistance technology that duplicates the benefits of free weights. With it, you'll feel the difference compared to other home gyms. The Bowflex revolution home gym comes with 200 lbs of resistance, and is upgradeable to 280 lbs for upper body workouts. Upper Body Workouts - with the bowflex revolution XP home gym, you can easily perform almost any exercise available from the equipment at your local gym. 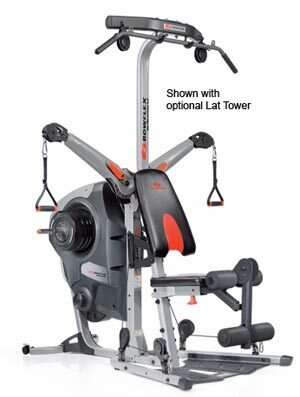 The Bowflex also comes with the Freedom Arms which can adjust 170° to work muscles from various angles. There is also an optional Lat Tower that lets you workout your back and shoulder muscles. Lower Body Workouts - Bowflex Revolution XP home gym works the leg and hip muscles without any bulky equipment. It also comes with a squat harness that allows a total body workout. Its leg attachment is included for seated leg extensions and standing leg curls to build your quads, hamstring, and thigh muscles. Core and Abs Workout - the Bowflex also features a wide variety of abdominal exercises you can perform. Add the Optional Ab Back Pad to power up your core workouts by up to 40%. Your satisfaction is guaranteed. Just purchase your Bowflex Revolution XP Home Gym and workout for up to six weeks. If you're not 100% satisfied with the results, simply contact Bowflex customer service department for Return Authorization. The Bowflex Revolution XP Home Gym will deliver years of worry-free performance. It's backed by a strong 10 year limited warranty covering defects in material or workmanship.